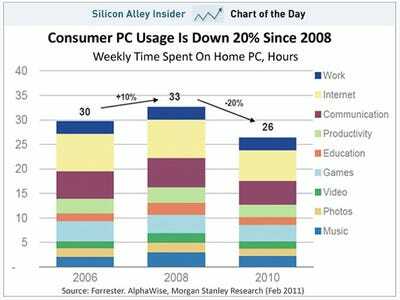 The growing use of smart phones and tablets have already begun to change peoples habits, causing a 20% drop in consumer PC usage since 2008. 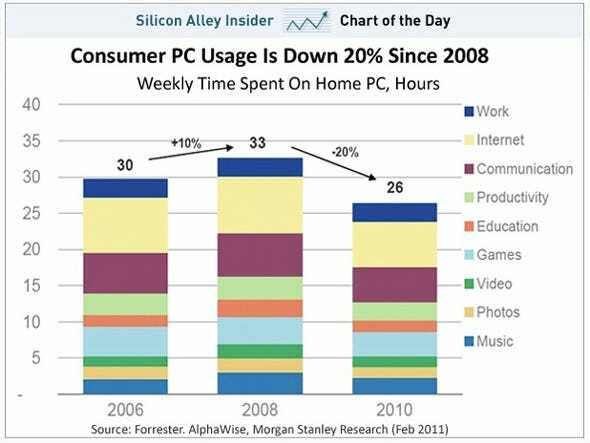 This chart, from a Morgan Stanley report on the tablet market, shows a drop in use of PC’s for music, communications and surfing the internet. The Silicon Alley Insider quotes the report as suggesting that as Smartphones continue to mature and offer more similar services to the PC, people will gravitate to mobile devices because of the ability to consume in a timely fashion.